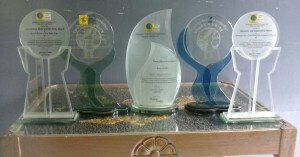 Some of the Philippine Schools Cyberfair trophies awarded to MSC through the years. This White House endorsed program encourages youth to become ambassadors for their own local communities by working collaboratively with community members and using technology tools to publish a website or create a video that displays what they have learned. The annual contest has involved more than 5 million students from 45,500 schools across 115 countries—and is considered the longest running international online event of its kind. Competition judging also takes place online. Students evaluate each others projects using a web-based evaluation tool (rubric) designed by Global SchoolNet. The top forty entries are reviewed by international judges to determine the best educational projects. Winners of International CyberFair are announced each Spring at a event that is global in itself, with hundreds of schools participating via Internet. MSC is also conducting its own “Cyberfair” thru an annual web design contest for schools in San Pablo City. Student representatives from different schools are given a seminar on web design and they make a website about their school or community. Prizes are given to students who make the best websites. All these efforts surely help put San Pablo City on the Cybermap. This entry was posted in Events, High School, History, MSC, San Pablo City and tagged Cyberfair, Global SchoolNet on October 14, 2014 by Jose Adonis Duma.